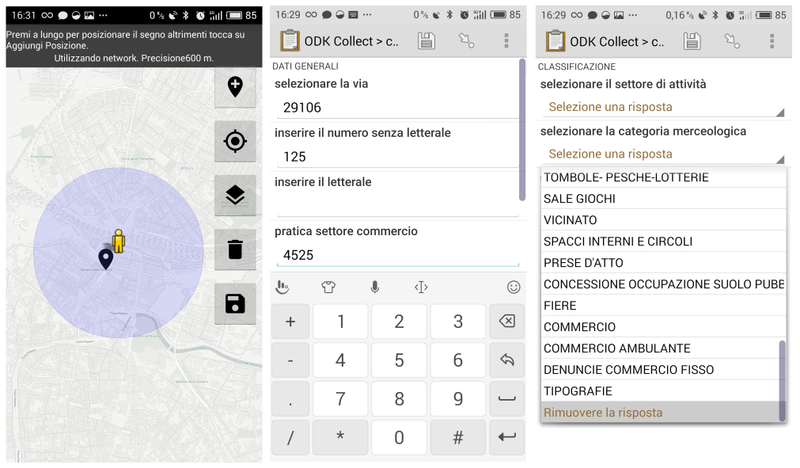 The Qgis plugin allows to build a “on field” mobile survey in few minutes starting from a Qgis layer and get back collected data with the help of Open Data Kit tools and services. Open Data Kit (ODK) is a free and open-source set of tools which help to manage mobile data collection solutions. 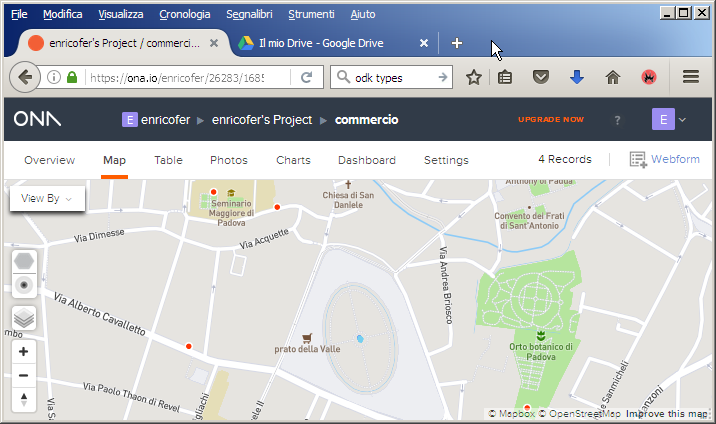 The QgisODK plugin generates forms (XlsForm/XForm) directly from loaded datasources converting the Qgis field Types to Odk Types according to Qgis Field Widget, upload ready to use forms to ODK aggregate server (at the moment the plugin supports ona.io and google drive) and retrieve collected data back to QGis. Switching to QgisODK from menu, toolbar or layer context menu appears the main dialog windows showing the field arrangement table and the function buttons. Together with layer fields are exported a geometry field needed for geolocation and a metadata field set, containing some autocompiled field related to submission and the collecting device. integer Integer (i.e., whole number) input. select_one [options] Multiple choice question; only one answer can be selected. select_multiple [options] Not supported by QgisODK plugin. geopoint Collect a single GPS coordinates. geotrace Record a line of two or more GPS coordinates. geoshape Record a polygon of multiple GPS coordinates; the last point is the same as the first point. dateTime Accepts a date and a time input. audio Take an audio recording. video Take a video recording. barcode Scan a barcode, requires the barcode scanner app to be installed. 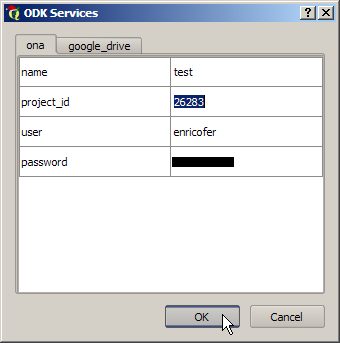 Fields associated to other Edit widgets are adapted to specific ODK types: CheckBox and ValueMap widgets are converted in select one ODK type translating the user defined values into ODK choices. Hidden edit widget are imported as disabled fields. Different ODK types define different behaviours in survey forms once imported in mobile device. 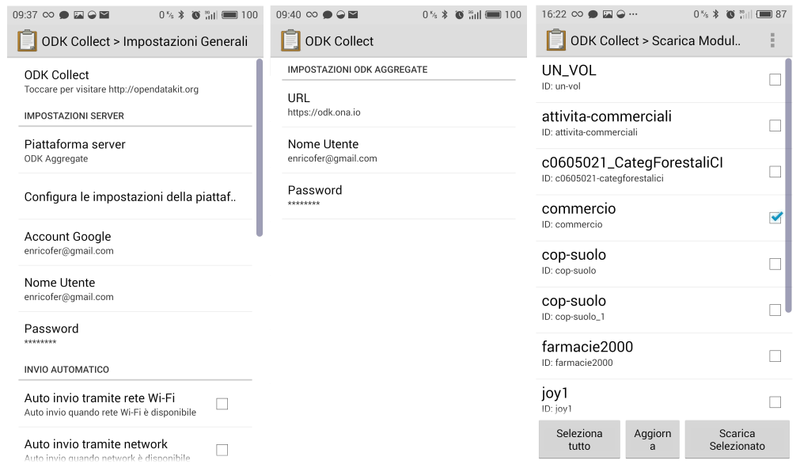 Here are reported examples the results in the mobile device for each ODK type prompt. 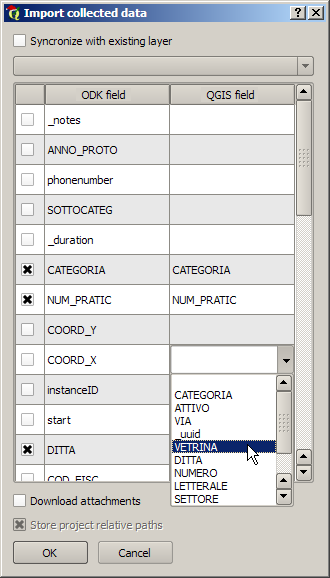 appearance to define different behaviors of the survey field in the app, depending from ODK type. Survey fields can be reordered and rearranged in groups dragging and dropping table items. In this example three new groups have been created: DATI GENERALI, CLASSIFICAZIONE e MEDIA. Single items are showed one by one in mobile app, while grouped items are showed as more compact stacked lists, useful to organize survey in thematic and subsequent steps. We are ready now to export the form to ona web service pushing on “export to web service” button on main dialog. If everithing goes right we will get a new form, called as the Qgis layer. 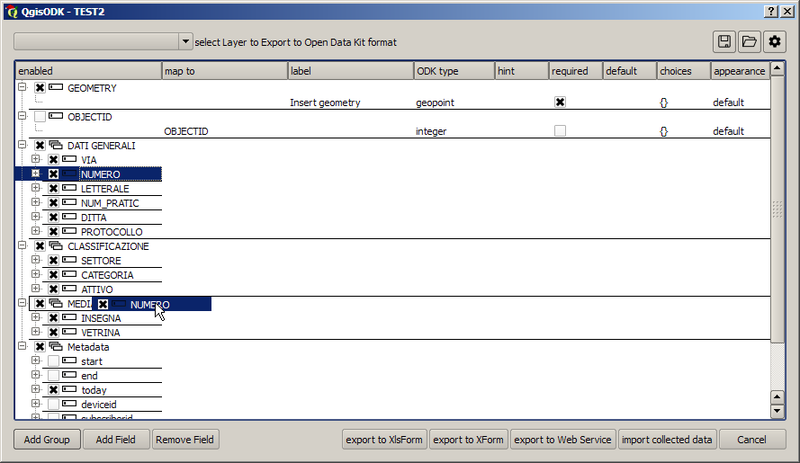 We are now ready to retrieve data to Qgis pushing “import collected data” button. 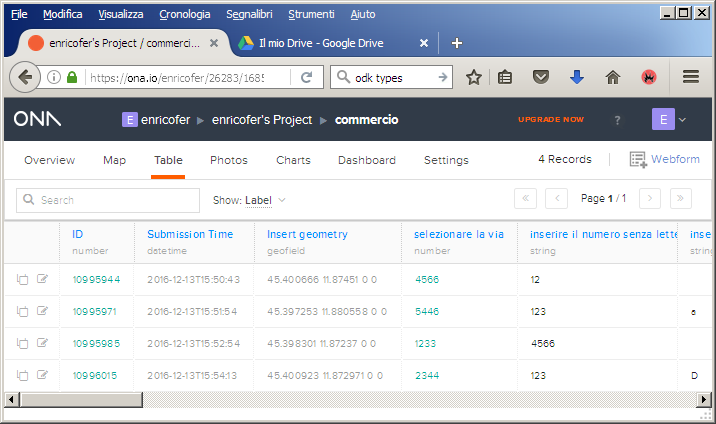 The requested data are enriched with a set of metadata related to survey, as submission time, instance UUID to avoid data replication, and geometry fields. The required parameters helps survey administrator to share forms and import collected data. 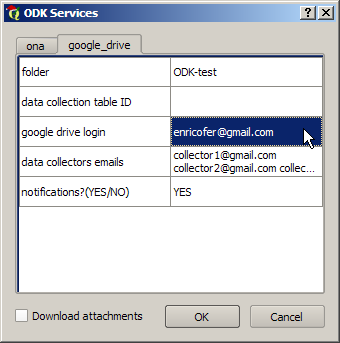 Pushing “export to web service” button in main dialog, the user will be prompted for google authentication, once authorized the plugin will upload Survey XForm (xml) to google drive in the folder specified in plugin settings under google drive tab, will create a new void data collection table in the same folder filling the data collection table ID field of the setting tab and will share all these documents with the users provided in data collectors emails field. Once survey activity started, the survey admin can import collected data pushing on “import collected data” button. 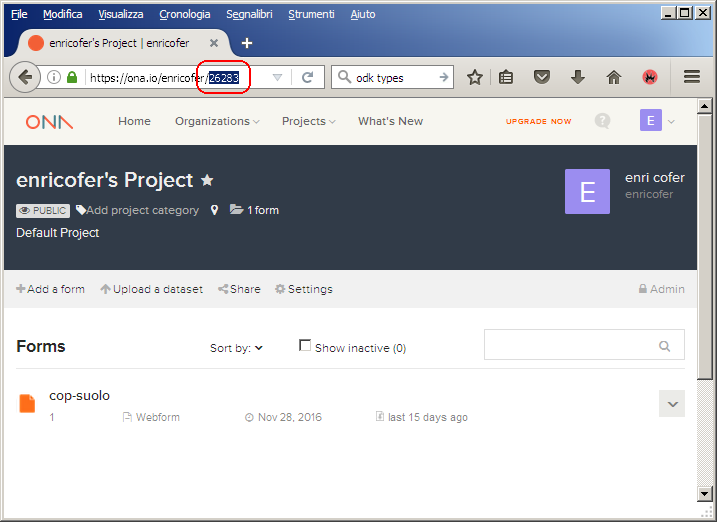 The user select the available table to be imported (only with Ona.io) then configure import parameters in the data in the “import collected data” dialog. The table can be simply imported or syncronized with an existing layer. In the first case a new layer will be created, in the latter data in the existing layer will be integreted with new data from odk provider. In this case the layer will be set to edited and charged with the new features. A new field called “ODK-UUID” is appended to Qgis Table allowing check to avoid duplicate data. 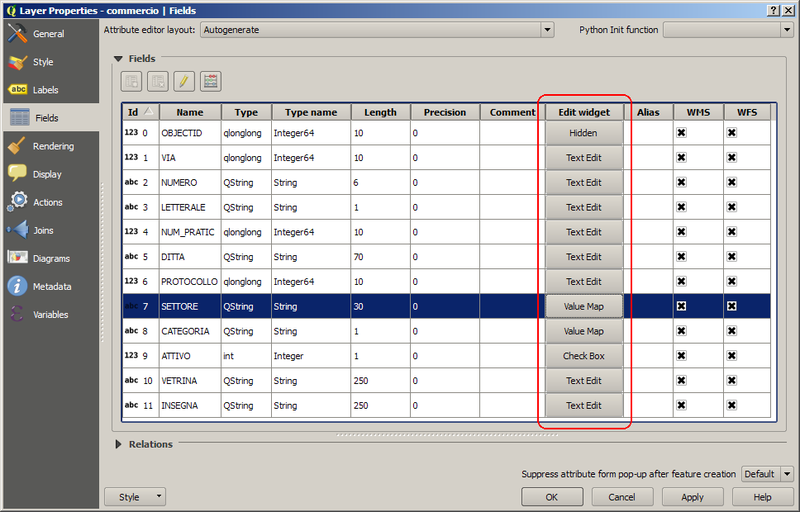 The first colums of the table enable or disable importing of the field on the right, the second column report all available ODK fields and the third one report the correspondant Qgis field if found. Doing so ODK fields can be mapped to existing Qgis fields. The last feature option is the ability to download locally the files attached to the survey forms such as images, signatures, videos or audios. The local path can be stored as absolute paths or relative to the project one.